For face, eyes, lips. For sensitive skin. No rinsing, no perfume. Compatibility dermatologically and ophthalmologically approved. 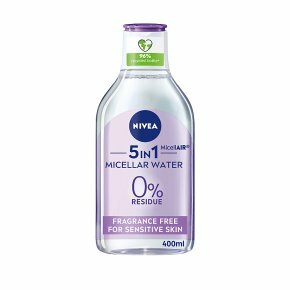 0% residue* *82% of 135 women agree Discover the magical power of NIVEA MicellAir Skin Breathe® Micellar Water. This 3 in 1 make-up remover: 1. Effectively removes make-up 2. Gently yet deeply cleanses 3. Soothes without leaving residue on your skin. How it Works: The micelles work like a magnet to efficiently catch make-up, dirt and impurities. The gentle yet effective formula can be used on face, eyes and lips. Perfume free and gentle on eyelashes. No rinsing and no rubbing. Result: Your skin feels perfectly clean, soft and supple, without any residue left. For healthy looking skin that can breathe. Application: Soak a cotton pad. Gently wipe over your face with closed eyes and lips.